THIS BEAUTIFUL HOME WITH AN OPEN LAYOUT BOASTS A LARGE FENCED YARD, KITCHEN WITH CUSTOM WHITE CABINETRY WITH ROLL OUTS AND SOFT CLOSE DRAWERS, STAINLESS STEEL APPLIANCES, A HUGE KITCHEN ISLAND, GAS COOKTOP, GRANITE OR MARBLE COUNTER TOPS THROUGHOUT THE HOME. GLEAMING HARDWOOD FLOORS RUN THROUGHOUT THE FIRST FLOOR. THE MASTER SUITE IS LUXURIOUSLY APPOINTED, WITH AN OVERSIZED MASTER BEDROOM WITH TRAY CEILINGS, A BATHROOM, WITH SEPARATE VANITIES, A JETTED TUB, SEPARATE WATER CLOSET, AND A BEAUTIFUL GRAY AND WHITE COLOR SCHEME. THE MASTER CLOSET IS ENORMOUS WITH PLENTY OF SPACE FOR CLOSET NECESSITIES. THIS HOME IS AN ENTERTAINING DREAM WITH AN AIRY FEEL AND A CLEAN AND CURRENT STYLE. Ready to visit 5002 SUMMER HARVEST? Request a free property tour! 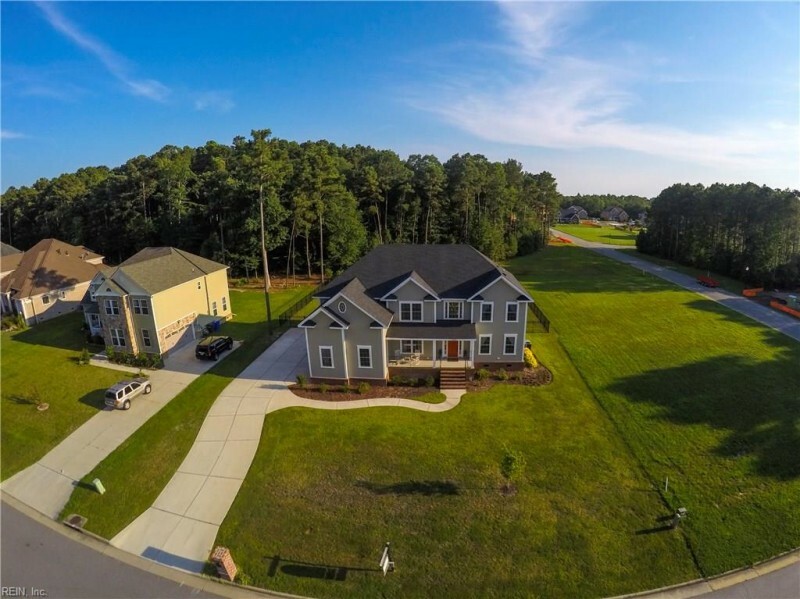 Send me more information about the listing at 5002 SUMMER HARVEST, Suffolk, VA 23434, MLS# 10139346. This 5 bedroom, 4 bathroom home located at 5002 SUMMER HARVEST, Suffolk, VA 23434 has approximately 3,300 square feet. It is currently listed for $469,900 and has a price per sqft of $14,239. This home is currently Off Market under the MLS#: 10139346. This listing is provided by BHHS Towne Realty. 5002 SUMMER HARVEST Lane, Suffolk was built in 2014. It has Garage Att 2 Car, Multi Car parking.The kitchen includes Dishwasher, Disposal, Dryer Hookup, Gas Range, Refrigerator, Washer Hookup. 5002 SUMMER HARVEST is part of the Pitchkettle Farms neighborhood located in 23434.